Summary: Have some1080/50p 60p AVCHD from Canon XA10,Canon XA20 or Canon XA25 but got error when importing to Final Cut Pro? In this article, we quickly walk you through the most effective way for getting Canon XA10/XA20/XA25 footage into FCP 6, 7 and X. Ever have experienced Canon XA10,Canon XA20 and Canon XA25, the top professional HD Camcorder? With it, you can record Full HD .mts clips at 1080/60p or 50p mode. While enjoying the stunning HD image quality, many folks are having problems when importing Canon XA10/XA20/XA25 60p/50p AVCHD footage to Final Cut Pro 6/7 (even with the latest FCP X). If you’re in such a situation, you can read on the article to learn more, which mainly shows you how to get Canon XA10/XA20/XA25 1080 50P/60P footage and FCP 6/7/X to work beautifully. The basic reason why you can’t successfully ingest those recorded AVCHD footages on 1080 60P/50P format to Final Cut Pro is limited by the FCP itself. Currently 1080/60p or 1080/50p footage is a very non-standard format and it’s unsupported in FCP 6/7 even the latest FCP X. In order to import Canon XA10/20/25 AVCHD footage into FCP for smoothly editing, you can use 3rd-party software to re-wrap and convert Canon XA10,Canon XA20 and Canon XA25 60p/50p MTS to ProRes encoded mov format first, which is a native format for Final Cut Pro 6/7/X. It’s a great way to achieve your goal smoothly. For this purpose, this article will show you how to transcode Canon XA10/XA20/XA25 AVCHD Footage to ProRes MOV in detail. UFUWare MTS/M2TS Converter for Mac is the best Mac Canon AVCHD to FCP Converter I choose. Fast convert AVCHD .mts from Canon XA10,Canon XA20 or Canon XA25 to Apple ProRes .mov files, which will fast import into Final Cut Pro project. As for video quality, at least I cannot distinguish any loss by naked eyes. 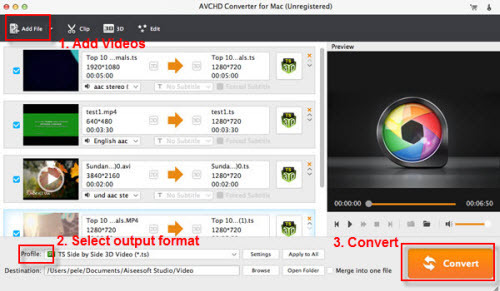 And this top AVCHD to FCP Converter for Mac can also help you convert AVCHD recordings to AIC for iMovie/FCE, MPEG-2 for Adobe Premiere, DNxHD for Avid Media Composer, etc. Press “Format” option and navigate the mouse cursor to choose “Format > Final Cut Pro > Apple ProRes 422 (*.mov)” as the best codec for FCP 6/7 and FCP X on Mac. The Mac AVCHD converter will transcode XA10/XA20/XA25 MTS to FCP 6/7 or FCP X compatible MOV with ProRes as video codec in HD 1920×1080. Click the “Convert” icon under the preview window, and the Mac MTS to ProRes Converter will start transcoding Canon XA10/XA20/XA25 1080p 50p/60p MTS to Prores MOV for FCP(X) on Mac. After the conversion, click the “Open” button to locate converted files, then load ProRes .MOV files in FCP (X). Now you can successfully and easily import Canon XA10/XA20/XA25 1080 60p/50p MTS footage to FCP 6/7 or FCP X for editing with best quality. 2. If you want to edit Canon XA10/XA20/XA25 MTS in iMovie/FCE, you just need to choose the “iMovie and Final Cut Express -> Apple InterMediate Codec (AIC) (*.mov)” in the second step.